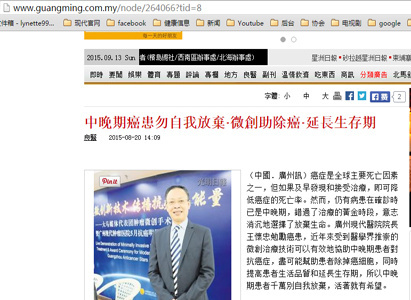 On August 20th, 2015, Guang Ming Daily in Malaysia reported the interview of Wang Huaizhong, the president of Modern Cancer Hospital Guangzhou. Mr. Wang said minimally invasive technologies effectively helped cancer patients in middle or advanced stage to fight against cancer, kill the cancer cells as much as possible, improve the life quality and prolong the lifespan. He also encouraged the cancer patients did not give up and to live with hope. Traditional therapy is not suitable for cancer patients in middle or advanced stage. The president Wang Huaizhong pointed out that cancer was divided into early stage, middle stage and advanced stage. The cancer treatments were different at different stages. Cancer patients in early stage usually took traditional therapy, such as resection operation, chemotherapy and radiotherapy. However, traditional therapy was not the first choice for patients in middle or advanced stage. Early cancer treatment included resection operation, chemotherapy, and radiotherapy, with the aim of treating patients radically. Take breast cancer as example. In early stage, breast cancer can be treated by resection operation. After the operation, combination of chemotherapy and radiotherapy helped diminish the residual cancer cells. However, for patients in middle or advanced stage, it may not be good to take resection operation because their body condition may not be available for that. The tumor in middle or advanced stage grew bigger. The cancer cells transferred but the resection operation was only taken for the obvious lesion and cannot diminish the cancer cells which had transferred to other parts. If patients insisted to take resection operation, their condition may deteriorate. The president of Modern Cancer Hospital Guangzhou, Wang Huaizhong told that many cancer patients were in middle or advanced stage at his hospital. They strived to help cancer patients kill the cancer cells, improve the life quality and prolong the lifespan. At present, there were 18 minimally invasive technologies, such as cryotherapy, local radiotherapy, interventional therapy, gene targeted therapy, radiofrequency ablation, combined therapy of Chinese medicine and western medicine, etc. in Modern Cancer Hospital Guangzhou. This year, two new technologies were developed, radioactive particle and chemical particle combined implantation and multiple targeted antitumor natural therapy, aiming to bring more hope for cancer patients to prolong their lifespan. Mr. Wang said, “In order to ensure the profit of patients, the oversea branch office was set up so that oncologist can evaluate the patient to make sure patients are able to tolerate the long trip, afford the cost, accept the expected therapeutic effect. In addition, according to patients’ concern, doctors make the individualized therapeutic regimen and tell them the risk, the treatment course, etc. After gaining the agreement, the staffs will set about the arrangement for patients to take treatment in Modern Cancer Hospital Guangzhou.